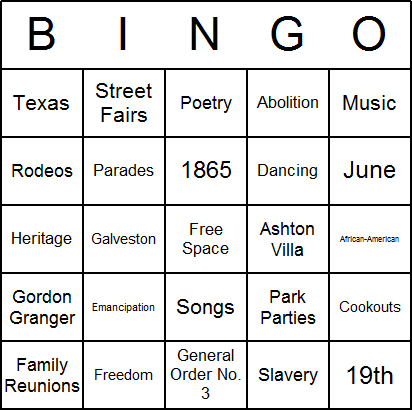 Below are some Juneteenth bingo cards, that were prepared using our bingo card maker software. Included in the set are 4 bingo cards, and a call-list. All you need to do is print them out, and you can play immediately. If you want to create your own custom Juneteenth bingo cards (perhaps with more bingo cards, different items, using colors or fonts, etc. ), then why not download bingo card maker software? You'll be amazed how easy it is. After you download bingo card maker software, you can easily generate dozens, or hundreds, of unique customized bingo cards, each containing a different selection of items, with the click of a mouse! Or, download juneteenth.zip which contains the PDF, and the Bingo Card Printer project (BCP file) which you can open in the bingo card maker software, and use as a Juneteenth bingo template so that you can easily create custom Juneteenth bingo card printables. In order to view PDF printables you will need to have Adobe Reader installed on your computer. Most computers should already have it installed.